What’s Still On The Table In The Grand Bargain Talks? Greg Sargent talks about this issue in depth in this post. He says that the Republicans are refusing to name their demands on “entitlement” cuts, instead saying that the Democrats must first say what they are willing to give. That’s very cute, but it doesn’t really work that way and they know it. If the Democrats are dumb enough to do that then we are all screwed. Kent Conrad and Chris Van Hollen have both said it. Recently. This is from November 15, 2012. Conrad: I wouldn’t want that to be the starting point, but as part of an overall package, that’s balanced and fair. Given that we now have exchanges to purchase insurance because of the president’s health-care reform law, it makes it much more acceptable, much more reasonable, over a long period of time to gradually increase the age given that people are living so much longer. White House officials in 2011 were in advanced talks with Mr. Boehner that would have agreed to some of these changes, notably raising Medicare’s eligibility age. That is one cause of liberals’ anxiety about how the coming talks may unfold. Details of the plan were not yet finalized before the Obama-Boehner talks collapsed on Friday. 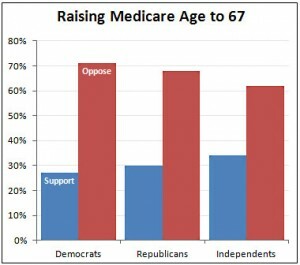 But in general, the agreement called for very gradually increasing the eligibility age from 65 to 67 over about two decades, according to administration and Republican congressional sources. One pathway would call for increasing the age by one month per year beginning in 2017 until it reached 66 in 2029. In 2030, it would increase two months per year until it hit 67. The administration’s willingness to entertain the idea may have given “a controversial idea more legitimacy and high-profile support than it’s ever gotten before,” Haberkorn observes, and it is likely to rile progressives who question the wisdom of the compromise. And that’s not the only problem. You’ve got Clyburn talking casually about changing to the Chained CPI just two days ago, which will effect programs all across the government including Social Security and Veterans benefits. If they want the Republicans to be the ones to own these cuts then maybe they should stop going on TV and offering them up. Everyone knows this happened as well. It will be better if we just let the Bush tax cuts expire and reset. Unless they do, that earlier negotiation will haunt the Democrats.